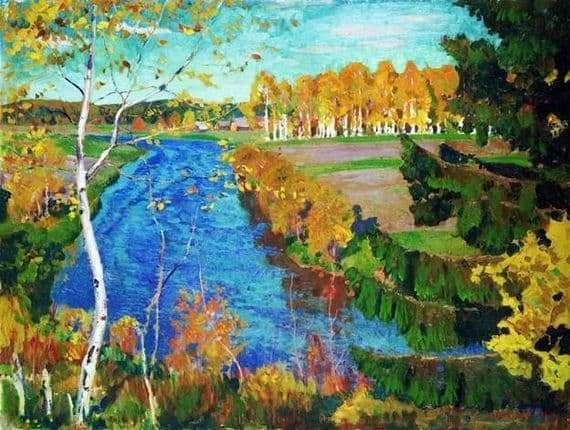 The artist created his famous landscape “Autumn on the River Tosna” as early as the 1920s. However, he still fascinates with its beauty and charm of any viewer. His work is distinguished by a complex composition, expressed by a multitude of elements and details, as well as active color moments. With all his own strength Rylov wanted to capture the beautiful moment he saw himself. He wanted to leave the contemplator alone with the autumn nature, its peace and tranquility, the relaxing murmur of a stream and the rustle of autumn leaf fall. To make him relax, listen and feel the beauty. Make stop the endless flow of time, relax and forget yourself on the river bank, surrounded by autumn nature. The riot of colors used in the work immediately elevates the mood of the spectator. Here and the incredible purity of the blue stream, and in some places blue, and in some places even a clear clear sky. Autumn foliage is striking with golden spots: it is on the top of distant trees, on the leaves of the birch so closely located, and on low earthen grass. And red foliage, reddened grass and dark shadow, cast by nature on the river, merge with it into a single whole. Forever green and mighty herringbone echoes the remnants of green foliage, and green spots, gently spread across the field. White birch stalks play against the backdrop of the landscape, merging with separated trees, village houses and white clouds. Despite such a rich variety of trees, the artist managed to balance all his landscape work. The flow of the river flows away somewhere far away, dragging the contemplator’s thoughts behind him and leading him into the calm of the blue expanses. His landscape embodies the calm and carefree nature of the autumn evening.